Ahmed Rashid, whose masterful account of Afghanistan's Taliban regime became required reading after September 11, turns his legendary skills as an investigative journalist to five adjacent Central Asian Republics-Kazakhstan, Kyrgyzstan, Tajikistan, Turkmenistan, and Uzbekistan-where religious repression, political corruption, and extreme poverty have created a fertile climate for militant Islam. 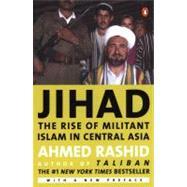 Based on groundbreaking research and numerous interviews, Rashid explains the roots of fundamentalist rage in Central Asia, describes the goals and activities of its militant organizations, including Osama bin Laden's al-Qaeda, and suggests ways of neutralizing the threat and bringing stability to the troubled region. A timely and pertinent work, Jihadis essential reading for anyone who seeks to gain a better understanding of a region we overlook at our peril. Ahmed Rashid is a journalist who has been covering Afghanistan, Pakistan, and Central Asia for more than twenty years. He is a correspondent for the Wall Street Journal, Far Eastern Economic Review, Daily Telegraph, and The Nation, a leading newspaper in Pakistan. His #1 New York Times bestseller Taliban has been translated into more than twenty languages. THE HISTORY OF ISLAM is a story of change and adaptation. Throughout Muslim history, movements have arisen periodically that seek to transform both the nature of Islamic belief and the political and social lives of their adherents. Since the seventh century, followers of The Prophet Muhammad have fanned out to spread His message throughout the known world. Muslim nomadic tribes—often originating in Central Asia—carried the word across the steppes and mountains of the vast Eurasian landmass, some peacefully as they drove their caravans of goods along the ancient Silk Route, others by conquest. The conquerors would transform the vanquished empire, but in time their empires would change and become urbanized, until each was in its turn conquered by new nomadic Muslim tribes. The changes the conquerors wrought—religious, political, social—have often been driven by the concept of jihad. In Western thought, heavily influenced by the medieval Christian Crusaders—with their own ideas about "holy war"—jihad has always been portrayed as an Islamic war against unbelievers. Westerners point to the conquest of Spain in the eighth century by the Moors and the vast Ottoman Empire of the thirteen through twentieth centuries, and focus on the bloodshed, ignoring not only the enormous achievements in science and art and the basic tolerance of these empires, but also the true idea of jihad that spread peacefully throughout these realms. Militancy is not the essence ofjihad. The greater jihad as explained by The Prophet Muhammad is first inward-seeking: it involves the effort of each Muslim to become a better human being, to struggle to improve him- or herself. In doing so the follower of jihad can also benefit his or her community. In addition, jihad is a test of each Muslim's obedience to God and willingness to implement His commands on earth. As Barbara Metcalf described it, "Jihad is the inner struggle of moral discipline and commitment to Islam and political action." It is also true that Islam sanctions rebellion against an unjust ruler, whether Muslim or not, and jihad can become the means to mobilize that political and social struggle. This is the lesser jihad. Thus, Muslims revere the life of The Prophet Muhammad because it exemplified both the greater and the lesser jihad—The Prophet struggled lifelong to improve Himself as a Muslim in order both to set an example to those around Him and to demonstrate His complete commitment to God. But He also fought against the corrupt Arab society He was living in, and He used every means—including but not exclusively militant ones—to transform it. Today's global jihadi movements, from the Taliban in Afghanistan to Osama bin Laden's worldwide Al Qaeda to the Islamic Movement of Uzbekistan (IMU), ignore the greater jihad advocated by The Prophet and adopt the lesser jihad as a complete political and social philosophy. Yet nowhere in Muslim writings or tradition does jihad sanction the killing of innocent non-Muslim men, women, and children, or even fellow Muslims, on the basis of ethnicity, sect, or belief. It is this perversion of jihad—as a justification to slaughter the innocent—which in part defines the radical new fundamentalism of today's most extreme Islamic movements. These new Islamic fundamentalists are not interested in transforming a corrupt society into a just one, nor do they care about providing jobs, education, or social benefits to their followers or creating harmony between the various ethnic groups that inhabit many Muslim countries. The new jihadi groups have no economic manifesto, no plan for better governance and the building of political institutions, and no blueprint for creating democratic participation in the decision-making process of their future Islamic states. They depend on a single charismatic leader, an amir, rather than a more democratically constituted organization or party for governance. They believe that the character, piety, and purity of their leader rather than his political abilities, education, or experience will enable him to lead the new society. Thus has emerged the phenomenon of the cults of Mullah Muhammad Omar of the Taliban, Osama bin Laden of Al Qaeda, and Juma Namangani of the Islamic Movement of Uzbekistan. The new jihadi groups are equally obsessed with implementingsharia(Islamic law). However, they see sharia not as a way of creating a just society but simply as a means to regulate personal behavior and dress codes for Muslims—a concept that distorts centuries of tradition, culture, history, and even the religion of Islam itself. The hallmark of the Taliban, Al Qaeda (The Base), and the IMU is the rejection of all historical experience, scientific experiment, and other forms of knowledge that Muslims (and other societies) have developed over the past 1,400 years. Thus the Taliban have tried to rewrite Afghan history in order to justify their repression of women and minority ethnic groups or their destruction of statues of Buddha. The new Islamic order for these jihadi groups is reduced to a harsh, repressive penal code for their citizens that strips Islam of its values, humanism, and spirituality. If God and the Islam of The Prophet Muhammad offer sustenance for devout Muslims to search their souls and seek meaning in today's ever-changing, complex world, the new jihadi groups reduce Islam to the length of one's beard and the question of whether burka-clad women are allowed to expose their ankles. Before September 11, 2001, this new phase in the long history of Islamic fundamentalism had gone largely unnoticed in the Western world. The unprecedented events of that day in New York and Washington, D.C.—when nineteen Al Qaeda militants trained in Afghanistan took over the controls of four aircraft and flew three of them into the commercial and military heart of America, killing close to six thousand people—changed the world forever. The civilized nations' battle against terrorism may well define the twenty-first century just as Nazism and the Cold War defined the twentieth. But to define these attacks solely as acts of terrorism misses the point of the new political phenomenon at work amongst small groups of extremists around the Muslim world. When a U.S.-led military alliance began bombing Taliban defenses and Al Qaeda training camps on October 7, few reports of the defenders mentioned that the man who was reputedly commanding the Taliban forces in Taloqan, in northeastern Afghanistan, was Juma Namangani, the military leader of the IMU. Still largely unnoticed amongst the many Islamic fundamentalist groups that have set up operational bases with the Taliban over the past few years, the IMU presents one of the biggest threats, for it aims to topple the regime of neighboring Uzbekistan's President Islam Karimov as part of a jihad that will reach across Central Asia. Comprising the republics of Kazakhstan, Kyrgyzstan, Tajikistan, Turkmenistan, and Uzbekistan, Central Asia is almost certain to become the new global battleground. Its history has been marked by more than two thousand years of conflict, as the great empires of the past fought to control the commercial lifeline linking Europe and Asia, the Silk Route. (Almost the only empire that did not at one time or another rule part or all of Central Asia was the Roman Empire.) But today's conflicts differ from the struggles of the past, and they stem largely from the changes wrought in the region by the Soviet Union—and from the chaos that accompanied its dissolution in 1991. For the majority of the people in Central Asia, independence from the Soviet Communist system did not immediately translate into an urge for democracy, the market economy, or Western culture and consumerism, as was the case elsewhere in the former Soviet Union, for example Russia and the Baltic republics. Instead, Islamic revival swept through the region. One of the key tenets of the Soviet system had been that religion was incompatible with communism, and the Communists methodically set about repressing all forms of religious expression within the country. As the Soviet empire fell apart, the people of Central Asia, who had been forced to renounce or hide their religion for seventy-four years, at last saw an opportunity to reconnect spiritually and culturally with their Islamic past. The Central Asians embraced Islam not only to reestablish their own ethnic and cultural identity but to reconnect with their Muslim neighbors to the south, who had been cut off from them ever since Stalin closed the borders between the Soviet Union and the rest of the world. Almost the first new visitors to the independent Central Asian republics were Islamic missionaries from Pakistan, Saudi Arabia, Turkey, and elsewhere, who helped build hundreds of new mosques and distributed free copies of the Koran translated into Russian and other native languages. Millions of Central Asians emotionally seized this opportunity to rediscover their identity and heritage, all of which they linked intimately with Islam. As I traveled through the region in that first heady year of independence, I was besieged by people wanting to know about the world of Islam outside their valleys and mountain villages. Few people knew about the Islamic revolution in Iran in 1979, the depth of the Palestinian resistance to Israel, or the mini-wars that had been waged by Islamic militants in Kashmir, Algeria, Egypt, and the Philippines. Many had forgotten their prayers and other rituals of Islam, even though an underground movement of itinerant preachers, as well as local mystics and teachers, had kept alive traditions of the faith, and the cultural and social mores that this faith fostered. What Central Asians did know about, however, for many of them had experienced its effects firsthand, was the Soviet Union's invasion of Afghanistan in 1979 and the ten-year war that followed. Thousands of young men had been conscripted into the Soviet Army and sent to fight the Afghan Mujahedeen (Islamic fighters). Contrary to Soviet expectations, many young men returned home with admiring stories of the sacrifices and Islamic zeal of their opponents. Even though some of their comrades had come back in zinc-lined coffins, the survivors spoke with glowing pride the Mujahedeen guerrillas' success and bravery against the overwhelming firepower of their own Soviet forces. Sipping tea, men of an older generation compared the Afghans to Central Asia's own Mujahedeen—the Basmachis—who had resisted the 1917 Bolshevik Revolution for more than a decade. Their hatred for the Soviet army and political system was obvious. The fact that they shared an ethnic and linguistic affinity with many of the people they were fighting made them realize even more deeply how the Soviet Communist system had deprived them of their common heritage and national pride. When independence came, with its rush of excitement and religious fervor, Central Asians nonetheless realized that the policies and actions of their governments would determine both the political and economic future of their fragile states and the future of their Islamic revival. Would the rulers embrace popular Islam and democracy and rejoin the wider Islamic world with its culture of tolerance, or would they continue the Communist policies of political, social, and religious repression—thereby ensuring greater resistance from the newly aroused population? Such critical decisions would determine whether the Central Asian countries moved towards stability and progress or tumbled into instability and civil war. Central Asian's reemergence into the world brought global conflicts as well. The region's enormous oil and gas reserves, which had lain largely untapped because Moscow preferred to exploit the resources of Russian Siberia, now became a battleground for the competing interests of Russia, the United States, and neighboring countries Iran, Turkey, Pakistan, and China. In what analysts quickly came to call the "new Great Game" (after the nineteenth-century rivalry between the empires of tsarist Russia and Great Britain for control of Asia), Russia, China, and the United States struggled to establish pipelines that would give them both access to natural resources and influence over the people of Central Asia. Afghanistan, which had been a pawn in the Cold War U.S.-Soviet rivalry since 1979, found itself still caught in the middle, despite the breakup of the Soviet Union. But the money the United States had funneled via Pakistan's secret service to the most extremist of the anti-Soviet Islamic fighters during the war started a movement that would change the game altogether. A new group, the Taliban, rose to power and set in place a model of extremist Islamic fundamentalism unknown in the Muslim world. With the financial and military help of the Saudi extremist Osama bin Laden, Taliban-ruled Afghanistan became a base for Islamic militants of every kind, who trained with the Taliban forces before returning to their homes to spread instability across the region. Helping the militants' cause were the shortsighted hard-line policies of the Central Asian regimes. The refusal of the leaderships to consider democratic or economic reforms in countries that had lost their main economic support (the Soviet Union), combined with their repression of religion, pushed moderates and political reformers into the camps of the radicals. The Central Asian regimes launched repeated crackdowns against Islamic activism, in which not only militants but thousands of ordinary practicing Muslims were jailed, tortured, and sentenced to long prison terms in new gulags set up in remote corners of their countries. For five years (1992-97) a bloody civil war pitting Islamic rebels and Tajik democrats against the Tajik regime engulfed Tajikistan, ultimately claiming more than fifty thousand lives. Hope emerged in Tajikistan with the end of the war, as the rebels and the government forces both accepted a peace accord in which a representative, coalition government was established. That fragile coalition has been threatened by four years of economic hardship and the incursions of Islamic extremists from neighboring Uzbekistan, but as of this writing it still holds—and carries the best hope for Central Asian stability in its model of a democratically elected government in which legal Islamic parties are represented. One of the greatest threats to Tajikistan's stability—and Central Asia's—is the Islamic Movement of Uzbekistan. Formed in 1998 by extremists who were dissatisfied with the moderation of the Islamic Renaissance Party and determined to topple the government of Central Asian strongman Islam Karimov, the IMU launched guerrilla attacks against the regimes from bases in Tajikistan and Afghanistan in 1999, 2000, and 2001. Under the military leadership of the charismatic Juma Namangani, the IMU has extended its jihad to the whole of Central Asia. The result is that the IMU is growing. Namangani is now recruiting dissidents from all of Central Asia's major ethnic groups, as well as Chechens and Dagestanis from the Caucasus and Uighurs from China's Muslim province of Xinjiang. With little to offer except the deposition of the current regimes and the institution of sharia, the IMU has nonetheless become a transnational group. Support flows in from across the region, and funding comes from as far away as Saudi Arabia—as well as from the narcotics and weapons trade out of Afghanistan. Another even more widespread Islamic movement, the Hizb ut-Tahrir al-Islami (HT; the Party of Islamic Liberation) has also taken root in Central Asia. If the IMU says little about its ultimate aims, the HT produces an abundance of literature about its goals, including a Web site (www.hizb-ut-tahrir.org). Unlike the IMU, the HT, which has also declared jihad in Central Asia, seeks to reunite the Central Asian republics and eventually the whole Muslim world by nonviolent means with the eventual aim of establishing a caliphate similar to that established after the death of The Prophet Muhammad in seventh-century Arabia. But the HT resembles the IMU in its complete lack of a social, economic, or political plan for governing this caliphate. Nonetheless, its utopian aims are becoming popular amongst college and university students throughout the region. And because the regimes equate all Muslims with militants, the HT's recruits are now filling the jails and penal colonies of Central Asia. Although every, act of state repression has pushed these movements into taking more extreme positions, distorting their original message, it remains true that the Islamic ideologies of the IMU and the HT are based not on the indigenous Islam of Central Asia, the birthplace of Sufism (the tolerant form of Islamic mysticism) and nineteenth-century Jadidism (the modernist interpretation of Islam), but on imported ideologies. Their message of extremism originated with the Taliban in Afghanistan, the militant madrassah culture of Pakistan (where many IMU and HT adherents studied), and the extreme Wahhabi doctrine of Saudi Arabia. Contrary to Central Asia's Islamic traditions and history,jihadin its simplest form rather thanijtihad(reinterpretation and consensus) has become the primary aim of these groups as they seek to mobilize popular support. The severe censorship practiced by the Central Asian regimes has made it difficult to uncover or verify any information about these Islamic movements. But rumor, myth, and the ancient Central Asian tradition of storytelling have created a different reality, adding to the mystique of these movements. In the villages of Central Asia, people speak of how the advance guard of IMU guerrilla groups consists of beautiful female snipers, who, armed with the latest scopes and night-vision goggles, can either seduce or kill a soldier from a long distance; of how the guerrillas' knapsacks are filled with dollar bills which they distribute to the farmers who feed them; of how two guerrillas held an entire battalion of Uzbek troops at bay; of how the guerrillas have been blessed by Muslim saints to make their bodies impervious to wounds or, conversely, to keep their bodies sweet smelling after death; of how the militants are funded by Saudis, Pakistanis, Turks, Iranians, and Osama bin Laden. The need to sift through the tales to separate fact from fiction is in part what prompted me to write this book. What is clear, however, is that Central Asia's problems are primarily internal, and they will not be solved simply by defeating the IMU. The lack of economic reform or development, the absence of democracy or free expression, the centralized controls of a Soviet-minded bureaucracy, and the growing cancers of corruption and public cynicism have made the situation in these countries increasingly fragile. As the leaders age, the population gets younger: more than 60 percent of the region's 50 million people are under the age of 25. This new generation is unemployed, poorly educated, and hungry—how long will it continue to tolerate the decline in living standards and the lack of rudimentary freedoms? A social and political explosion seems inescapable unless the demands of the young are addressed. But the ruling elites cling to power at the expense of all else. Indeed, their regional jealousies, rivalries, and competition have kept them from even the most basic measures of self-protection. They cannot agree on the formation of a joint security belt, much less a common Central Asian market that would have a chance to improve the well-being of their people. Meanwhile, religion and ethnicity remain intensely combustible issues. At the heart of Central Asia lies a cultural vacuum, which cannot be filled with imitations of Western culture. By ignoring their heritage, which has given so much to their own people and to the wider Islamic world, Central Asia's rulers deny their people a chance to create a modern identity from their own past. By refusing to accommodate traditional Islam, democracy, and interethnic harmony, the Central Asian governments fuel the fires of extremism. The Central Asian regimes now have a new chance to reverse this trend. By joining the U.S.-led alliance against the Taliban and Osama bin Laden, they have given their countries a tremendous opportunity for change, economic development, and democracy. The gratitude of the West, of Russia, and of China can be called upon in future resource-development deals, assistance with the creation of new political institutions, and a better life for their people. The chance is there. It is for Central Asia—and the world—to take it.